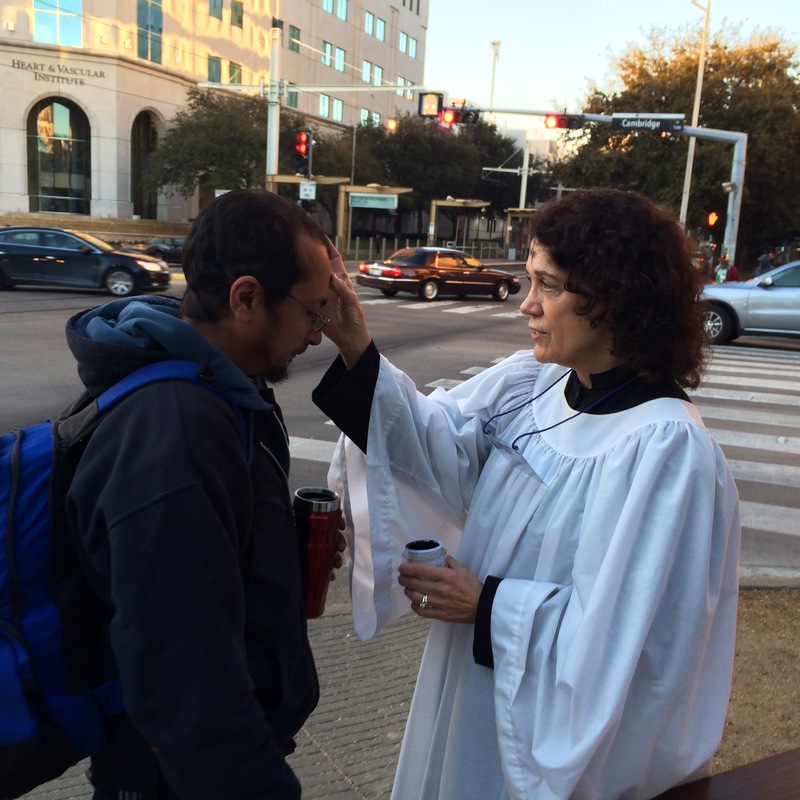 Yesterday was Ash Wednesday, which marks the beginning of the penitential and introspective season of Lent for most Christians around the world, including the Christians of Palmer Memorial Episcopal Church in Houston, Texas. It shouldn’t be surprising, therefore, that we held four services at various times throughout Ash Wednesday for our members and guests to observe that beginning liturgically and to receive not only the imposition of ashes, as a symbol of our mortality and utter dependence on God’s grace, but also the sacrament of the Holy Eucharist. What is surprising to many — and controversial to some — is that members of our congregation also offer to mark the foreheads of strangers with ashes in the shape of a cross, reminding them that, while each of us will return to the dust from which we were made, God’s love surrounds and sustains us, now and always. 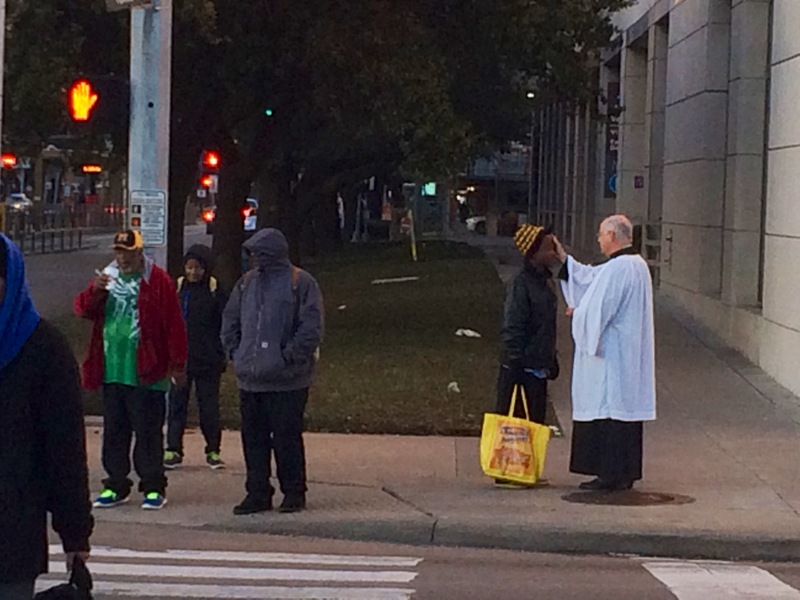 Parishioners sign up to do this in hour-long shifts at the intersections and light rail station near the church. Most of the people who either walk or drive past them are heading into or through the Texas Medical Center, which is the largest medical center in the world. Hermann Memorial Medical Plaza, for example, is a 30-story building that is located directly across Cambridge Street from Palmer’s campus. Passers-by include medical professionals of all kinds, family members of patients, people with cancer or other diseases, the cleaners and maintainers of the hospitals, and human beings with no home. All of them are created in the image of God and are loved by God. Last year Palmer reached out to 944 strangers in this way on Ash Wednesday. This year we far surpassed that number, making a connection with 1,594 fellow travelers on the road of life. All of us, even if we don’t know it, need mercy and forgiveness. The man in the photo below stopped to talk to us early in the morning because he was curious about why we were outside. I told him that the ashes are a symbol of the reality that we are finite and fragile, yet embraced by an infinite and loving God. I also said that Christians reflect on that reality throughout the several weeks before Holy Week and Easter. Then a parishioner made the sign of the cross on his forehead, reminding him of his mortality and of the fact that he is not alone and leaving all three of us a bit teary-eyed. The reason we do this is to have these kinds of encounters with people who are usually strangers to us but never strangers to God through the love of Jesus Christ. We bring that truth into the public square.